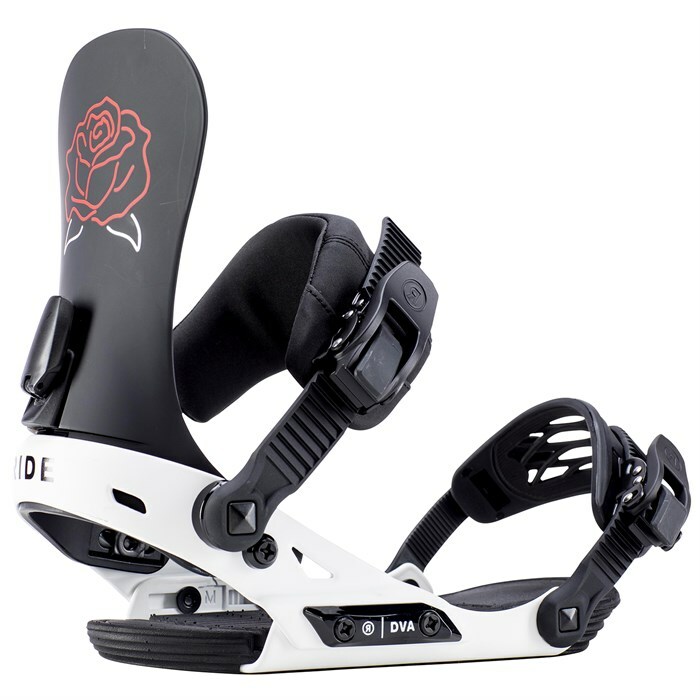 If being a "diva" is defined by snowboarding competence on any terrain possible, then the Ride DVA Snowboard Bindings are sure to be your new BFF. Designed with a women's specific Slimeback™ highback that has a slightly shorter and more ergonomically correct shape, along with a mid-range flex and hassle-free strap/ratchet system, the DVA Bindings stand out as a stout freestyle-oriented option that delivers all over the mountain. EDGE™ Chassis  A versatile, all-mountain performance chassis featuring easy adjustment, stance correct heel cup and micro disc mounting for 2x4 inserts and channel compatibility. The Edge is built with 100% aircraft grade 6061 aluminum alloy to deliver durability and performance for the advancing rider. Wedgie™ Footbed  An ultra-light footbed uses subtle angles to align the ankles and knees to a more natural and comfortable position. The angle also gives leverage to press the board for huge pop, without affecting your preferred stance width. Offered in two levels to accommodate your physical stance and riding style. The standard Wedgie™ is ideal for riders looking for the utmost drive and ollie pop, along with those that prefer an extra wide stance. EVA Basepad  A sheer layer of vibration absorbing material that deadens high-speed chatter. Micro-Disc  Built for enhanced all-around binding flex and performance, the Micro-Disc is 30% lighter than the standard. Built for 2x4 patterns, but also mounts to a slot/channel board. Slimeback™ Highback  These highbacks utilize urethane similar to Ride's Slimewalls® technology. The Slimeback™ material absorbs shock and damps vibrations to help smooth the ride while providing fluid support. L.S.D. Stance Correct Shaping  All of Ride's Women's highbacks are designed for the unique ergonomic needs of female riders. Built shorter than the men's highbacks with extra top flare. Stitched Ankle Strap  Traditional binding strap construction featuring a clean flip and stitch construction made from multi-density 3D padding and formed neoprene. ThinGrip™ Plus Toe Strap  A convertible toe strap that is lightweight, over-molded rubber web for super snug boot grip. Linkage Ratchet  Designed to improve ladder durability and eliminate ratchet wag, resulting in a smoother user experience with the same hold you expect.